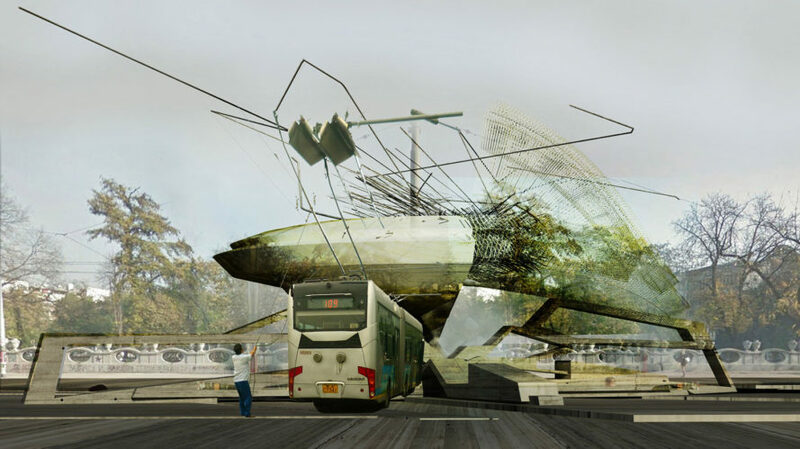 Margot Krasojevic's new project for Belgrade envisions a futuristic public transportation and lighting system powered by piezoelectricity. The proposal calls for trolleys powered by 3d-printed piezoelectric cells that generate energy from even the simplest human movements, such as walking or running. In the case of Belgrade, which relies heavily on trolleybuses for public transportation, this phenomenon is adapted to create power as the vehicles pass through several stations scattered across the city. The project uses 3d-printed piezoelectric cells applied to each trolley pole, trolley bus elevation, tire and overhead wire. Aluminum consolidated carbon nanotubes, which increase the heat and electrical conductivity of the material embedded within the structure, are combined with the steel frame, concrete-clad helix. The aluminum frames are printed with piezoelectric crystals that generate electricity from the air flow and pressure exerted from the trolleybus and its overhead wire movement. Elevated walls further increase the vibration of the trolley-poles, augmented by wind and rain. These vibrations amplify the the piezoelectric cell displacements which, in turn, generate energy. The design will act as an electrical amplifier, and will provide street lighting and WiFi access to immediate neighborhoods. Users will also be able to use the system to power their gadgets and smart cars, while the electric current stimulates root growth in plants. The project uses 3d-printed piezoelectric cells applied to each trolley pole, trolley bus elevation, tire and overhead wire. Aluminum consolidated carbon nanotubes, which increase the heat and electrical conductivity of the material embedded within the structure, are combined with the steel frame concrete clad helix. Aluminium frames are frames printed with piezoelectric crystals that generate electricity from the air flow and pressure exerted by the trolleybus and its overhead wire movement. Elevated walls further increase the vibration of the trolley-poles, augmented by wind and rain. These vibrations amplify the piezoelectric cell displacements which, in turn, generate energy. The design will act as an electrical amplifier, and will provide street lighting and WiFi access to immediate neighborhoods. Users will also be able to use the system to power their gadgets and smart cars, while the electric current can also stimulate root growth for different plants.